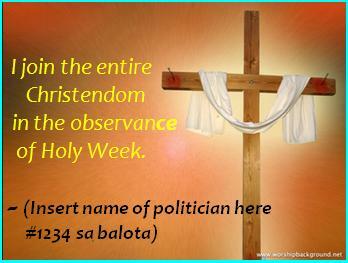 POLITICS, HOLY WEEK, KRIS ATBP. HAVE YOU HEARD President Aquino’s Holy Week message? He’s blaming GMA for the capture and crucifixion of Jesus Christ! During the senakulo, the senators themselves will reenact the Last Supper. Chiz Escudero can’t wait to have wine. Congress is staging its own senakulo. There’s a problem though: they can’t find someone who’ll play Jesus because most, if not all solons are only qualified to portray the role of the two thieves. The Lower House picked Lucy Torres to play the role of the Virgin Mary. But there are rumors she’ll be ousted from the cast. Holy Week is considered as a period of suffering. James Yap has a term for that: marriage. Netizens are divided over the Kris Aquino and James Yap issue. Half of them admired James, the other half admired Viel. After announcing her resignation, TV host Kris Aquino left the country… for Castel Gandolfo. Kris Aquino is reportedly studying governance and law. Not to be outdone, James Yap is reportedly studying how to choose women more wisely. A Philippine Entertainment Portal survey showed more Filipinos tend to believe James Yap over Kris Aquino. 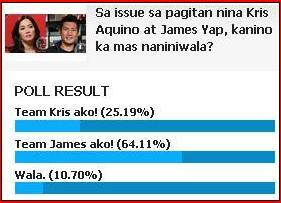 Based on the online poll, 6 of 10 believed James while nearly 3 of 10 believed Kris. They were Ballsy, Pinky and Viel. Guesting live on TV, actress Heart Evangelista said she’s standing by Chiz Escudero… much to the disappointment of her mama, her papa and UNA. The head of NASA says if a giant asteroid similar to the one that exploded in Russia a couple of weeks back hits Earth, the only thing people can do is “pray.” If that asteroid is heading towards the Philippines, the Supreme Court can always issue a status quo ante order to stop it. If it’s true that a large asteroid is heading towards Earth, I hope it hits politicians who dance the Gangnam Style in campaign sorties. 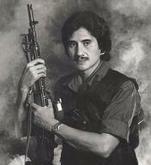 In a radio program, Loren Legarda admitted that she had a crush on Gringo Honasan. That’s probably the reason why Honasan’s wife wanted to crush Loren Legarda. Gaganapin si Cong. Winnie Castelo bilang si Hesus, RJ Echiverri and Benjo Bernabe as Dismas and Gestas. Pangulong Aquino bilang si Poncio Pilato. Si Precious at si Karl Castelo ay gaganapin bilang Birheng Maria at si Juan. Have a blessed Holy Week, Heckler. p-noy ‘no mates’ is going to watch old films and musicals for the holiday. Good Job PH. nakaka lurky yung picture ni KRISTETA.. In the latest sws survey 55% think heart evangelista will not be the first lady. The other 45% thought she is most probably chiz’s 25th lady of easy virtue. Previous Previous post: TAKE 2 NA ‘DAY!